The kitchen industry is seeing a shift away from the almighty all white kitchen trend which has swept the industry over the past couple of years and is now seeing a move towards natural materials, brass accessories, monochrome minimalism and patterned splash backs. This year there will be a shift toward warmer metal tones such as brass and copper, edging away from the brash, stainless steel and chrome colder metals. Iron and similar tones are making a come back, very much learning towards the timeless traditional. Bold brass and copper kitchen hoods and appliances (where possible) will be big in 2014 -2015. Natural tones and materials is big across all interior design hemispheres, including kitchens. Brick or stone veneer adds a rustic one with nature feel, and if done right, will look terrific for time to come. Old natural beams, which look fantastic with stain or beeswax will be installed. New builds and designs will seek to build beams and tongue and groove into the walls and ceiling: An extra cost yes, but absolutely worth the finish it gives. Like the Scandinavians do best: Simple, classy and sleek. The trend has been around for some time, but this basic, stream lined look is here to stay in 2014. To avoid a cold uninviting kitchen experience, add some natural wood accessories, which will do wonders to the aura of the room. Tiled splashbacks aren’t welcome here: Just solid slabs of marble, strips of glass or other solid wall coverings. This will continue to be a winner in 2014. Outside kitchens, like the one below and the pool house kitchen in the cover picture are on the up. While they’ve been growing and have been popular in the United States, other countries have yet to pick up on the trend. Weather is a limiting factor to some degree, but it won’t stop this trend from growing in those harsher climates, such and the United Kingdom and other areas in Europe with questionable weather. In wet, cold and blustery environments, a sliding glass screen would work well to prevent the need for constant cleaning from weathering, while enabling versatility in its use, both in gorgeous and questionable weather conditions. Impressive and glamorous: A definite showpiece for any home which can host an outdoor kitchen. Kitchens are yearning for a sip of excitement and edge which is why interesting and colorful splashbacks will be popular in 2014. Grand Designs magazine has placed this as the number 1 Kitchen trend for 2014. Look for tiles with interesting patterns, in colors (blue), colorful splashes of the rainbow or exotic designs. Keep the rest of the kitchen minimalistic. Hidden spots under cupboards has been the prevailing trend in kitchens for the past 5 years, however now we are seeing a move back to exposed, sconce lighting. Look for lighting fixture which are showpieces in themselves. We’re leaning towards rustic metal fixings, copper and brass, however don’t feel constrained to the traditional. Directional sconce lighting will also be a winner in 2014. 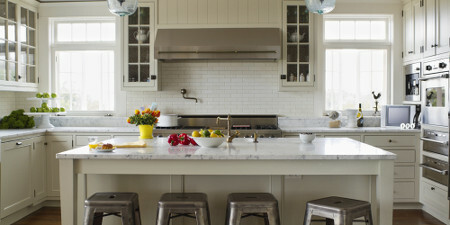 It’s not complicated; match the style of lighting fixture to the style of kitchen. If you have a monochrome minimalistic Scandinavian design, go with modern, if you have a traditional kitchen with lots of natural tones, use a more traditional brass light fixture. Anybody who read my last article on interior design trends in 2014, you would have noticed a continuing trend within it: Loads and loads of blues. Blue is the color for 2014 and is without a doubt a winner for kitchens also. Don’t feel constricted to one type of blue either, mix it up; use soothing navy blues, uplifting sky blues, energetic electric turquoise; they all have their merits, and if done right, they’ll hit the spot if combined together. Look for blue accessories, cupboards and tiles in 2014. Love them or loathe them, but the headline in the latest issue of Essential Kitchen and Bathroom Business Magazine states, ‘Ikea looks to revolutionise the kitchen industry’. The the release of their first new kitchen range (Metod) in over 25 years, the Swedish based company is looking to stamp it’s place in the kitchen industry. What’s interesting is their range; leaning towards an almost city apartment conversion feel, with brick veneer walls, natural wood countertops and black-brown Laxarby doors; oh, and don’t forget the copper accessories. Though they are a massive influence on the public’s persuasion of what is in and what is out, Ikea aside, natural is growing fast in 2014. Look for natural wood or stone counter tops, natural walls (possible brick veneer), natural wooden cupboards. Anything that comes from the earth is good (within reason of course!). Again, we’re going natural black countertops here using black granite or quartz. Whether left glossy, or has a dull matte finish, in contrast with a cool white interior, oozes a timeless and clean cry of, ‘I’m not new, but I’m here to stay, and I look GOOD!’. It’s not a fresh trend but it’s popular and with anything popular, the trend isn’t going to expire without a fight. Still in for 2014: black countertops (leaning towards a matte finish). Kitchen cabinets will always be useful in all kitchens, but now we’re seeing a trend towards open shelving. Why hide away those eye catching kitchen accessories and crockery behind closed doors: These have design and appeal too. Now people are wanting to show off not only their fancy kitchen, but also everything else (of good quality), which is in the kitchen. While still in an infancy, this trend is growing quickly and we’re seeing designers and manufacturers implement open shelving in their 2014 designs. This is what a kitchen is (primarily) all about: Cooking. Any large, impressive kitchen with all the utensils, counter space, ventilation and appliances which would be fit for a chef is impressive, and when designed and implemented right, can be the centerpiece of the entire house. Chunky wooden countertops, brush steel appliances, ample ventilation, accessories which would make Jamie Oliver tear up with joy; this is what to look for in 2014. Go big, or go home; create a chefs paradise in 2014. Tip: Try to cultivate the culinary ability to match the kitchen to avoid embarrassment. Similar to a previous point using warmer metal fixings, I’m going to be more specific here in saying we’ll not only see warmer fixings become more popular, but copper in particular. Copper accessories, utensils and bold outlandish copper kitchen hoods will be in. Off the shelf copper hoods work, but if you can find a bespoke custom made one, that’s where the real magic lies. Copper is in, all around the home and the kitchen is its dominion, so look for bold copper statements in 2014 when designing your kitchen. Materials has been upgraded nowadays.